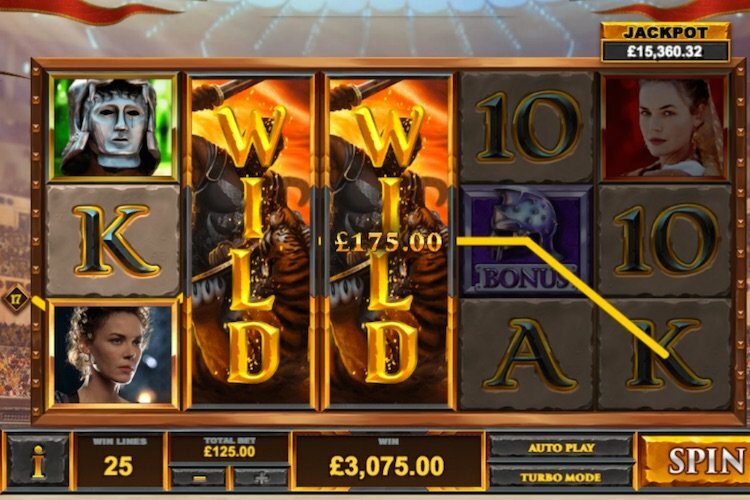 Playtech have launched a new version of their popular Gladiator video slot. Based on the Oscar winning movie, the original slot was launched in 2008. Ten years on and Maximus and co are back in Gladiator Road To Rome, a 5 reel and 25 payline game that features characters from the film. 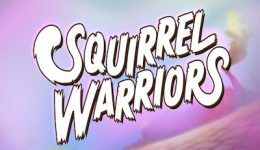 It’s not as glossy or big budget as more recent movie slot games, but the game does have a progressive jackpot as well as a host of exciting features. As well as Gladiator, the characters that feature on the reels are Commodus, Lucilla and Proximo. They are joined surprisingly by Tigris of Gaul, the Gladiator who’s brought out of retirement to fight Maximus once his identity has been revealed in the arena. The remaining symbols are the standard 9, 10, J, Q, K and A plus scatters. If Maximus fills a single column then it turns into a stacked wild. Wagering on Gladiator Road To Rome starts at 25p a spin. You can select to spin up to £125 by using the buttons at the right of the win lines box at the foot of the game. Players can choose auto play and turbo modes by clicking on the relevant buttons. Get three or more scatter symbols during play and you’ll be whisked off to the sands of the colleseum. First pick 3, 4 or 5 shields to get free games, extra wilds or multipliers. Once you’ve made your selection you move on to discover your wins from this free spin round. The other feature of the game is a bonus round. If three bonus symbols appear on reels 2, 3 and 4 then the feature is triggered. Nine helmets will appear – these can be bronze, silver or gold and all have a cash value. Reveal nine gold helmets to win the progressive jackpot. The game itself is good, although for a revamped game it doesn’t look particular new. We’d have liked to have seen a bit more gloss and perhaps even some film clips to accompany proceedings. Interestingly you don’t see Russell Crowe’s face at all in this slot. You only see him as Gladiator! We suspect that may be because of image rights or perhaps Mr Crowe doesn’t want to see his face on video slots? Gladiator Road To Rome is available to play at a number of Playtech powered casinos including those listed below. New Players Only. Deposit and wager minimum €/£5. Winnings from free spins paid as cash. Free spins expire 7 days after acceptance. 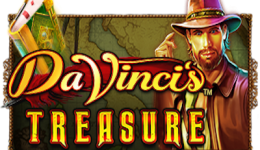 New Casino players from UK & Ireland only. SMS verification required. 18+. begambleaware.org.